Yesterday, Venezuelan authorities threatened media outlets covering a spate of public protests over the controversial detention of a group of university students. For weeks, demonstrations targeting issues ranging from political reform to poor conditions in university housing facilities have been under way in several cities. Protests intensified last week after several students were detained on accusations “association to commit a crime,” amongst other charges, during a demonstration in the city of San Cristóbal. The students remain behind bars. A series of photos from recent protests can be found on Últimas Noticias. In the midst of a newsprint crisis that has caused nine newspapers to close and more than twenty to reduce their page counts, and while national television channels are submitted to strict content regulations, hardened even more in recent weeks by President Nicolas Maduro and his so-called “war on sensationalism”, digital media has proved vital in covering news that has is no longer covered by traditional media. Today, as opposition leaders summon rallies around the country, people are expected to turn to social media to learn about the development of the demonstrations, which likely will not be reported on any public or mainstream news platforms. Your post exemplifies the bias in coverage against Venezuela so common in the US and Western media. 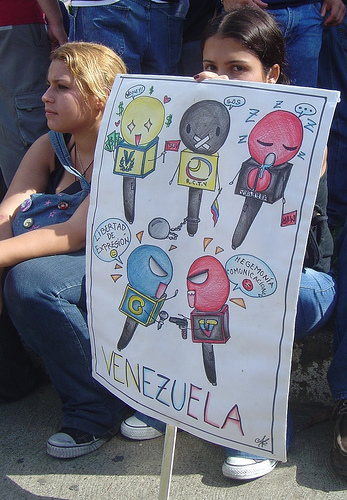 The “opposition” is attempting to provoke violence and destabilize the government in coordination with the vast array of anti-government press of Venezuela, as they did during the coup of 2002. Watch the documentary “The Revolution Will Not be Televised” to get a glimpse of how right wing, politically motivated, ready-to-lie, and anti-democratic the Venezuelan opposition truly is. Furthermore, the Venezuelan opposition is circulating old and misleading photos and videos of police repression in order to incite more violence. Not every “revolution” is worth defending, especially those that use lies and violence with fascist elements against a government that has proven to be a boon for the common Venezuelan.